Okay, so this is weird. 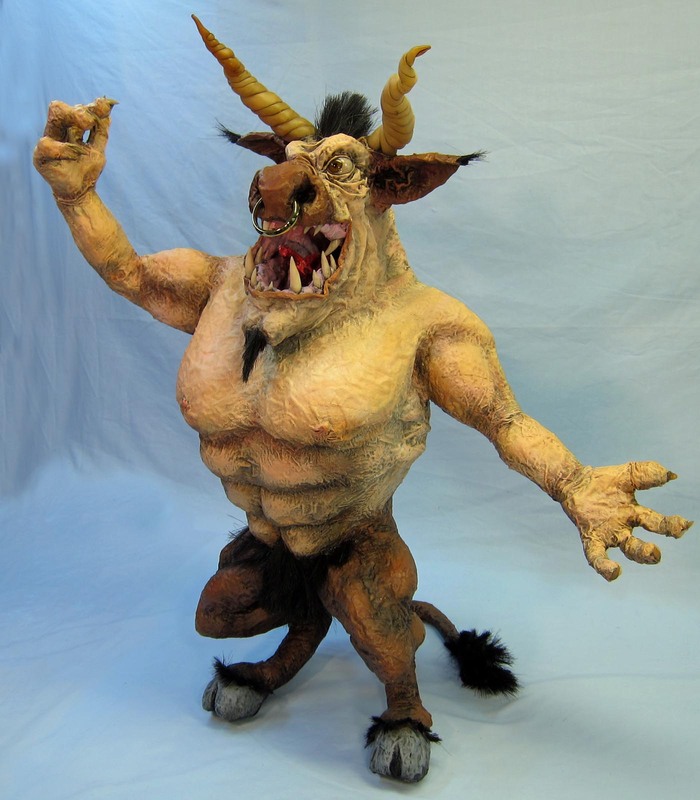 I’m absolutely sure that I posted photos of my Minotaur (for the Screamer Challenge on the Paper Mache Art Facebook page) here. But I don’t see it. It must have been in my dreams. It was the first of three non-dragon projects I made before allowing myself to get back to Drogon. So…ignore this if you’ve already seen it on Facebook. Oh…and of course there is a video of this being made. http://youtu.be/Pwil6b4_DHU It shows the project as I originally finished it. But I hated it. So I changed the mouth and the nose. I like it better now. Okay, NOW back to Drogon! 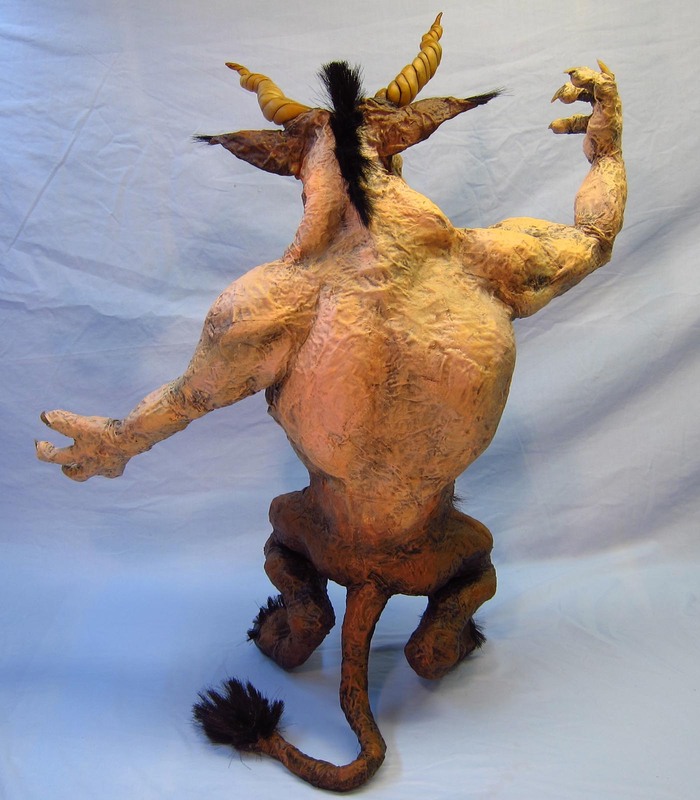 This entry was posted in Paper Mache Minotaur and tagged fantasy, Greek Drunks, Greek Gods, mixed media, paper mache, paper mache instructions, papier mache, papier mache recipes, sculpture. Bookmark the permalink. Hi Cherry. Wow, not sure what I was thinking. Anyway, thank you! Glad you saw this. I thought Haggis was a grotesque food. What is it? I am cannot find the words to express my thoughts on this except WOW!!! I have not had the pleasure of seeing him before. You have such an amazing talent. He is absolutely , positively, perfect. What a nice surprise to get this kind of comment! Thank you Diann. It makes me glad that I posted it! Woah!! This is exceptional, fantabulous and extra amazing! Well, that’s an interesting idea Cherry! I did make a guy out of guts once as a commission for a gastroenterologist. I put him in a “keep on truckin” pose with big boots. It was a lot of fun. Can we see it? do you have a pic? The Haggis monster is right up your alley….heheheh. Guts etc…Love your great work! always looking forward to seeing what is next! I might have an old photo. Not sure where it would be. I’ll see if I can dig it up. It was many years ago when I was first doing commissions. I’d like to see a photo too. Ok. I’ll see if I can did it up. Your creations are just plain fantastic and I love looking at them.Thank You..
I’m very flattered Leisa. Thank you! Thank you for sharing your gifts with us Dan. I want you to know that I always smile when I see how you bring the characters to life out of this medium. Always inspired is how I feel when I see your artwork. What a nice thing to say Leslie! Thank you! That made me smile. Whoa, Quite the guy there! looks like alot of work and has your style for sure, He’s a good change to see and show your versatility! We all know you have that though… You are a workin manaic Dan! So glad you are retired! Thanks Suz. I don’t know how I ever had time to teach! Glad you like this crazy guy. yep, I saw him in facebook, but never here. Wonderful! 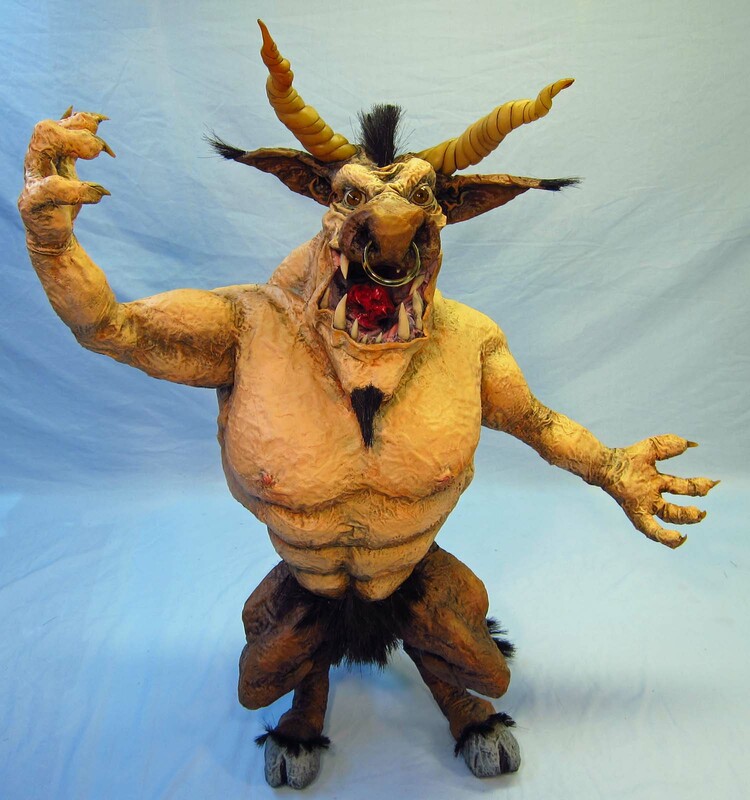 Do you keep all these creatures in your basement or are you allowed to show them to the regular visitors in you house? 🙂 Either way, I bet your house is way cooler than Madame Tussauds museum could ever dream of! Hey Nacho. I have projects all over the house. Not ceremoniously displayed either. Just laying around till I can find a spot for them. I’m like a hoarder but it’s all my own art. It is a bit strange. Nice to hear from you! Hope you are well. Wow, what a beast! I love the musculature and expression. Thanks monster-man Lyman! I’m glad you like this. I love the masks you are making. I hope people check out your site. Thank you so much Andres! Nice to hear from you! I hope you are well. This is great, I hadn’t seen this project before. Glad you like it Stella! of two cats with abscessed teeth). Glad you like this one. Bummer about the cat’s teeth. Thank you Lenora! I’m really flattered. What awesome creativity. I would love one of these. I would love to blog on you. You make awesome dragons! Im going to buy your book! (maybe also about the monsters) But please tell me where do you buy those eyes? They are fantastic! Those are taxidermy eyes. Many companies online. Thanks for the post! Crikey! I missed this too! Dan, he’s really cool and just perfect! Love the work still, do you by any chance remember the website that you got those spherical eyes from? Hey there. You know, I don’t remember exactly. But there are only three or four companies I use. My problem is that I buy lots of eyes then throw them in a pile to be used at some point. If you google “taxidermy eyes” you will see those companies. There aren’t that many eyes. They are bound to stick out. Sorry. That’s ok, thanks for the tip keep up the wonderful work. Hello Dean. I have a mask tutorial on Youtube which shows much of what I do. I have how-to books. And my blog (www.papermacheblog.com) which shows many of my pieces being made step-by step. It is all there. Good luck with your art!